Soon after Donald Trump was elected President of the United States, his former campaign manager, Corey Lewandowski, and another campaign advisor, Barry Bennett, moved to cash in on their affiliation with the new administration by opening a consulting and lobbying firm called Avenue Strategies (Avenue) with an office one block from the White House. Lewandowski soon left the firm, but that didn’t stop Avenue from signing up lucrative clients. Through the second quarter of 2018, Avenue earned $1.2 million from 13 clients including the Bank of Beirut, Citgo, and the Center for Sportfishing Policy, according to federal lobbying disclosure documents filed with Congress. Avenue lobbyists have also registered with the Justice Department as agents for several foreign clients, including the Embassy of Qatar, a Congolese political party, and the former prime minister of Ukraine. 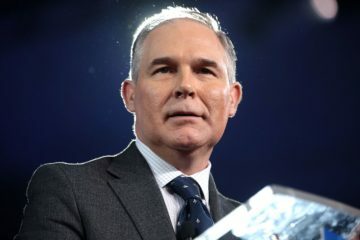 BROOKOVER: And so, you know when, I think about Scott Pruitt at the EPA and I think about the officials at the EPA we’ve dealt with, and you know, we just come in with a set of what we think are facts, dealing with a — we had one client there that has concerns about a rule that they imposed late in the Obama administration, and all we were able to do was to ask that client to go in and meet and talk to some folks and get some facts, and you know, the rule’s been, the rule was delayed and then ultimately not fully implemented because, you know, the facts they had in front of them, which were not being considered under the Obama administration. Here’s the thing: None of the lobbying disclosure reports filed for Brookover or anyone else at Avenue discloses lobbying the EPA. Without more information it is hard to know whether the discrepancy means Avenue simply failed to include the EPA in its disclosure of government entities contacted on behalf of one of its existing lobbying clients, entirely failed to disclose a lobbying client, or if the firm’s activities regarding the EPA fell short of the legal thresholds for registration and disclosure. Brookover’s comments on the podcast could be read as suggesting each direction. 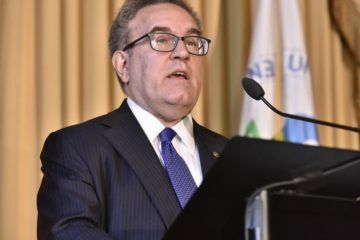 At the beginning, Brookover talks about “the officials at the EPA we’ve dealt with,” suggesting the type of activity that one would generally expect lobbyists to perform for their clients such as engaging with government officials and sharing information relevant to government policy. Indeed, interacting with EPA officials in the manner that Brookover initially describes would easily meet the definition of a lobbying contact. 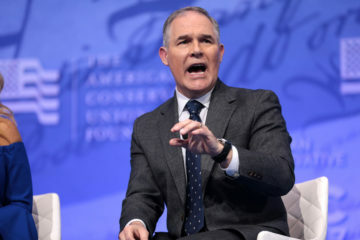 When Brookover gets more specific, however, his word choices also raise the possibility that the firm’s unnamed client met with EPA officials unaccompanied by Avenue’s lobbyists, though armed with their guidance. “All we were able to do was to ask that client to go in and meet and talk to some folks and get some facts,” Brookover said. If all they did was provide a client with advice before the client met with agency officials on their own, and did not make contact themselves, then Brookover and Avenue wouldn’t need to register as lobbyists on behalf of that client. Even if Brookover or one of his colleagues attended a meeting with a client at the EPA, they still may not have been required to register as a lobbyist for that client. 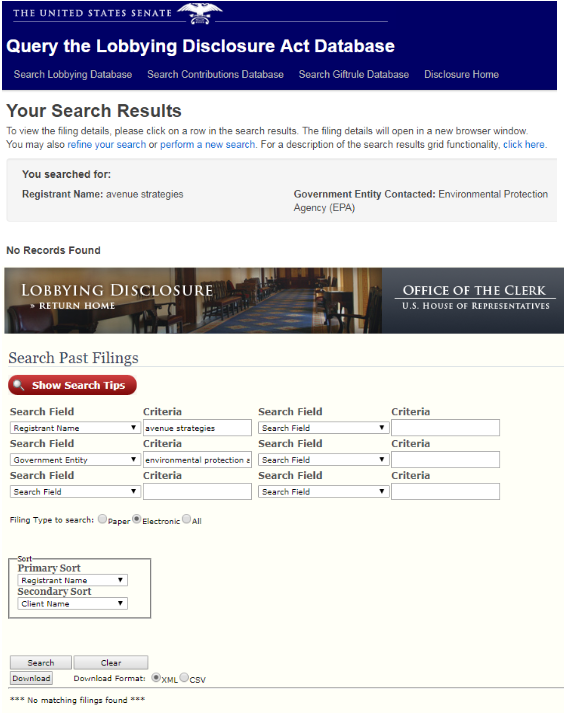 Under the Lobbying Disclosure Act, a lobbyist only has to register as representing a particular client if three factors are satisfied: 1) Did they make more than one lobbying contact with a covered official during their entire time working for a client? ; 2) Did “lobbying activities” account for 20 percent of the individual’s time working on behalf of that client over a three-month period? ; and 3) Were they paid more than $3,000 during that period to lobby? When a lobbyist does register for a client, they are then required to report quarterly the houses of Congress and federal agencies they contacted as part of their work for the client, the amount they were paid, the issues they lobbied on, and other information. Regardless of whether the exact services Avenue provided for the client should have been reported or not, the fact that the activity described by Brookover is not reflected in his firm’s lobbying reports underscores a well-known fact in Washington. The money flowing through the city’s influence industry is far greater than what is reported to the public. Though most of Avenue’s non-lobbying clients remain shrouded in secrecy, a few of the companies the firm has worked with have been publicly reported. For example, in May, The Daily Beast’s Lachlan Markay reported that Avenue once had a consulting deal with the tobacco company Altria, which according to CNBC’s Brian Schwartz, called for Avenue to help the tobacco giant use voter registration data as part of a communications strategy aimed at fighting any potential new regulations of the tobacco industry. Avenue also advised Lockheed Martin on how to smooth out the defense contractor’s relationship with President Trump and appliance manufacturer Whirlpool reportedly also sought advice from Avenue prior to a discussion with Trump about jobs. President Trump came into office promising to “drain the swamp” of the Washington, DC influence industry, but after 19 months it’s still business as usual. Insiders like the former Trump advisers at Avenue can make good money using their connections to help their clients — both disclosed and undisclosed — shape government policy in their favor.